When an entire island nation (that was essentially forbidden to visit for 50 years) suddenly opens up to you, you go there. Period. The end. That was my rationale when I visited Cuba in January 2017. There are still some legal requirements for American tourists visiting Cuba. As of this writing, you must choose one of twelve legal reasons to visit Cuba; you must keep a full itinerary of activities (including receipts) documenting that your travel was in support of your chosen visa; you must retain those receipts and itinerary for 5 years following your travel. I did my homework on the legal requirements for traveling to Cuba and very deliberately maintained a full time cultural exchange and educational tourism visit per the requirements of my “Educational – People to People” visa for the totality of my 10 days in Cuba. All along the way, I shared wonderful experiences with warm, fascinating people. Cuba is a rich country with a troubled history. In spite of economic hardship and politically repressive regimes (even before Fidel Castro), the Cuban people share a proud cultural heritage. I experienced amazing warmth, friendship, camaraderie and hospitality as a first-time visitor to their homeland. What did it feel like to explore Cuba? What was the journey like as a solo traveler? And an American tourist? In one of the world’s last Communist countries? Here are the stories of the people I met in my 10-day exploration across 4 stops in Cuba, and some of the moments we shared. Marcial and Nerza like to sit side-by-side in matching wood and wicker rocking chairs. The chairs are the elegant kind, the sort of another age, when furniture was crafted with pride and passion and hands. The elderly couple’s day begins in these thin but sturdy rockers with the daily news. Urgent notes soundtrack scenes as they flash across the screen: some local, one American, one South American, another from Germany, Syria, Israel, and Russia. The headlines don’t sound positive; they’re uttered with a familiar flavor of reporter-melancholy. Even droll news headlines sound eloquent in Spanish. I adore the spoken music of its oral patter. Spanish is a rolling drum of a language, and putters consistently with light and crisp notes born from the middle and front of the tongue. Inside the small home, Marcial and Nerza have splashed synthetic roses and fake potted flowers across the peach linoleum floors. The flowers are dusty. But their artificial color — grey-green, grey-yellow, grey-red — break the peach monotony of the interior. Decor is otherwise sparse. A towering tapestry of a peacock against an East Asian style landscape has faded for decades to a sickly pale. The inglorious bird neighbors a certificate of hospitality issued from the Communist government for hosting foreign tourists. Everything is regulated. Beside that hang two unproud, also-faded photos of Fidel Castro and Che Guevarra, the paper cut to halo their heads, placed side-by-side in a rather empty wooden frame. When I arrived, Nerza – the matriarch who keeps an immaculate home and asserts herself with bullish confidence that reflects the depth and authenticity of her otherwise flawless grace – welcomed me with warmth and unintended intimidation. She commands me for minutes in a narrative I have no chance to understand, being that I can’t speak much Spanish. We struggle to establish the length of my stay because I, seeing two beds in my rented room, have misunderstood her to be asking how many patrons are staying in her home. “No, uno, just me,” I insist. She means two nights’ stay. She’s correct. And I hope to have not unintentionally evicted myself for the second night of my reservation. Nerza cleans, sets breakfast in the morning, and manages the home with efficiency. She even navigates the television volume, which turns from the news to nature programs in the afternoon. Nerza competes determinedly with the street noise outside of their first-floor apartment home in Old Havana. The windows and door are gated, but flung open. Neighborhood children, fellow gringo tourists and loud 1950s-era Chevrolets and Buicks bumble by in an unkempt urban chorus. You get the impression from Marcial that he is a good, happy man, and one both proud and willing to move and act in support of his strong wife. Te bueno, te bueno, he says, You’re good, you’re good, when I interrupt the gaze of the married couple and their television programs to reach the front door. I pause at the door though, when I glimpse the image of President Obama. Cuba and America are making news. A controversial policy from the 1990s, unofficially dubbed Wet Foot, Dry Foot, has been rescinded. The policy was born of a refugee crisis, and prioritized refugee status (and ultimately, citizenship) for Cuban immigrants who were able to dangerously traverse 90 oceanic miles from Cuban shores and land on American soil in southern Florida. If they made it to dry land, they were saved, and expedited through the process of American citizenship. If they only reached the shore by boat, and didn’t find “dry feet,” they were returned to Cuba. The sort of twisted “race to the finish line” policy has been argued as inhumane, essentially incentivizing the harrowing and dangerous journey from desperate immigrants who would risk everything to seek asylum in the United States of America. Obama’s action is seen as a continued effort of the last few years to normalize diplomatic relations with Cuba, which is why I’m able to travel here, at all. I step outside of Marcial and Nerza’s home and into the streets of Old Havana. I walk three blocks north and arrive on the Malecón, a storied oceanic seawall shaped in a roadside crescent, which begins at the mouth of the harbor to Havana and gapes west while staring north toward America, where Cuban refugees will no longer set desperate boats and floats and hope to reach freedom on a dry shore. Night descends on Havana and the city seems to breathe, finally. Maybe it’s me who’s breathing, finally. The dizzying color, sound and pace of the avenues has receded into the evening. And now draped in dusky shadows I feel more comfortably me — even in this foreign place, far from home. I’m sitting in a cool, nouveau eatery in Havana on the edge of tight city streets that, unlike the other side of the city, hold their facades and their pride. Cha Cha Cha is a tacky name; one that does not suit the gastronomy and decor of this place. Full wine bottles are tucked like ceiling tiles over a broad blue-lit bar. Faint monotone murals don the one-and-a-half stories: the top floor is sliced diagonally, and hangs open in the air to the floor below, and the street beyond. Wooden tables mirror the organic vaulted interior. Edison bulbs create artful light throughout. The clientele is young and chic. And in a heavenly white glow across the street in a large, closed glass box sits at rest a vessel called Granma, which, in 1956, carried 82 guerilla fighters, including Fidel Castro and Che Guevara, from Mexico to Cuban in what would become known as the start of the Cuban Revolution. The white box gleams as would a heavenly garage. Imagine what would be seen by the eyes of some world renowned car collector as he took sight of his ultimate dream vehicle. There it is: Granma, sealed in an air-tight glass container like a science exhibit of an exhumed Mammoth, for one and all to behold. But Granma (which as it sounds means grandmother), is a national monument and a hallmark emblem of Cuban patriotism, or Communist propaganda, depending on your point of view. Granma is alone in her glowing white case, but accompanied by symbols of revolution, machines of war and even armed guards who stand there through the night. There is a green tank, there the anti-aircraft battery loaded with a non-weaponized missile. An old ambulance is bullet-holed. There is the eerie, torn jet engine of an American spy plane that was shot down, its pilot killed, during the Cuban Missile Crisis of 1962, as American reconnaissance sought proof that Soviet nukes were in fact being armed on the island nation. Every symbol means to be one of patriotism, emblematic of Cuban defiance of dictatorship; proof positive of Communist righteousness in spite of American imperialism, the global superpower, the capitalist bully, just miles north, who couldn’t stop Fidel’s revolution, and couldn’t remove him from power — though they tried, and tried. “Your order, sir,” the bartender, in heavily-accented English, interrupts my daydream. Here is a copper pot of Cuban rum and juices, adorned with a slice of pineapple and sprig of fresh mint. Here is fresh fish ceviche, caught somewhere in the nearby turquoise sea, topped with delicate red fruit and green cilantro. Here are slices of crisp chicken tenders, battered in crushed almonds, neighboring a small dipping cup of sweet chutney. Sometimes I wonder about men in power and the games they play, the egos and ideologies that press the billions of the rest of us to the brink of wars that could extinguish our whole planet, and all of us with it. What good is winning the pages of history if there are no pages to read; no one left to read them? I turn my back on the proud symbols of warfare, guarded, illuminated in the Havana dark. “Buen apetito,” the bartender tells me with a smile. The morning is off to a rocky start — as rocky as a start can get in the Eden-esque mountain town of Viñales, Cuba. If the Old West was lush, it would be Viñales. Far from lawless but carrying an old world ease and charm, Viñales rests in a valley of southwestern Cuba, situated between Jurassic mountains and dropping cliffs. A picturesque avenue is Main Street: The sleepy town is dotted with colorful one-story ranch style casas. Farms sprawl as far as the eye can see. Tropical vegetation needles from every available crack and crease. Feathering palms and mango trees stand proudly, uninterrupted, in backyards and on street corners alike. The vibe here is easy-going, friendly, familial. This is a departure from Old Havana — and, for the city-weary me, it is a welcome one. I woke up this morning to a chorus of roosters screeching the day anew at 4 AM. Earplugs were no match for the farm fowl’s frenzied festivities. But the “rocky start” rests on the backs of these horses. Another Western tourist surprised both horse and human when she suffered a panic attack as she prepared to mount her saddle, effectively spooking the energy-sensitive animals. Horses, as prey animals, are said to be acutely present to threats; even unintentionally implied ones. The young lady’s sudden and uncontrollable panic has made the the horses aware of a nearby danger. The panicked girl does not ride with us, and a couple more riders (who were justifiably unnerved by the rough beginning to our ride) have abandoned our group tour of nearby farms. But the awkward beginning smooths within minutes. The horses settle into the familiar rhythm of paths they’ve traversed countless times. And the big, beautiful landscapes of the Viñales valley emerge before us. Perfect green tobacco sprouts burst from rich black earth toward the sun. Pairs of oxen draw archaic ploughs across red soil, upturning sweet potatoes and yucas; little white scavenger birds follow in line, hoping to score an errant earthworm or two. Our guide is a tall and blue-eyed cowboy; I don’t remember his name, but because he seems to know everyone whose path we cross, I start to call him El Presidente. He moves with a blend of grace and bravado; his 6-foot-plus stocky frame magnifies the bigness of his laissez-faire attitude. He loves life, nature, horses, rum, cigars, and women. At the end of the first horse trail, El Presidente, two fellow American riders and I come upon a small hollow wooden cabin: a hollow kind of shed, with window gaps and door cut out from the walls. Inside is Alejandro, a stout, bullish man in his late 40s with a puffy, soft face that could pass someone in his late 30s. Alejandro is an organic tobacco farmer who treats his craft like an artform. His eyes are dark but soft and honest, as if born of toil and hard work . His nose is wide, but his straw cowboy hat is wider. He speaks English well, squeezes halves of heavy fruit like pineapples into pulp with with his vice-like hands, and demonstrates his crucial role as one of those responsible for turning delicate tobacco seeds into world famous Cuban cigars. He hands each of us one like a proud father. These are leaves that he’s grown, picked, fermented and rolled himself. “Two ‘cooc,” he says, indicating two Cuban Convertable Pesos (or “CUC”) for the cigar. It’s $2 US. But there’s a hole in this story, and Alejandro has yet to fill it. This is Communist Cuba, after all. A socialist society. The government here collects an enormous share of profits from every legal sale and service; both an intermediary and a regulator, the Cuban government has a hand in all services rendered. Companies are collectively owned. And, indeed, most of the world’s famous Cuban cigars are produced by government-owned tobacco factories. How are we paying Alejandro for these, his own Cuban cigars? They pay him just 40 CUC — equal to $40 USD — for 50 kilos, or 110 pounds, of tobacco leaves. “It is better than before,” he says, indicating they used to only pay 25 CUC for the same harvest. Alejandro gets to keep the remaining 10% of the tobacco plants in his crop. From it, he rolls his own cigars, which he assures us are infinitely better than “other” Cuban cigars — the kind the government produces from his leaves in their factories. Alejandro ferments his cigars with cocoa beans and fruits for a year. He rolls them by hand, and “glues” them with organic honey harvested from wildflower hives in Viñales. He removes the stems of his cigars’ tobacco leaves, which contain the most nicotine in the plant. “They don’t do that in Habana,” he tells us. El Presidente disrupts the show by seizing a plastic cup of Cuban rum from the demonstration table. He takes a swig, and thrusts it into my hand. In his sharp blue eyes is a look I’m familiar with from old days of college dorm parties — a brotherly challenge, a gesture of friendship masquerading as a dare. I take it, and shoot the remainder. On the eve of expansive Viñales, where abundant farms stretch from foot to distant mountain, I arrived in the hard and perplexing city of Cienfuegos. It is large and capable in its infrastructure: roads wide, sidewalks intact, buildings weathered but proud. None of this could not be said of Havana, Cuba’s capital city. And yet Cienfuegos, “One Hundred Fires,” feels closer to extinguished. The atmosphere is unhopeful. Where have the people gone? Have they left for one urban pole of the island nation, Santiago east or Havana west? Do they live beyond the reach of my eyes, and if so, why has the big space of city center repulsed them? Why is main street hollow? The city feels tired. As lost as the ideals of Communism. If Cienfuegos has a collar, its collar is blue. Large freighters loom in the distance of the bay; one is given the impression that this city exists on its macro-function of importation of goods. And perhaps, once, of Western tourists, too. Has tourism of old left a fatal mark on this city, and thus, in its wake, I witness its new and collective refusal? I note the two areas where gringos tourists seem confined, or at least comfortable: small but well-groomed alleyways that edge the nearby port, where Caribbean vessels likely dock. Foot traffic marches in predictable patterns and street hustlers embargo the intersections, though neither aggressively nor offensively. And yet it is a frustrating gauntlet to maneuver; nearly demeaning. The joy of raw and open observation is robbed, for their understandable targeting of outsider money feels like further proof of your outsider status in a foreign place. Thus guarded, tourists quicken their pace and move defensively between gift shops and polished restaurants which encircle a large and clean park square. This park is a capsule to their comforts; but it is not Cienfuegos. No other square in the city looks like this. None are as manicured. None as wealthy. I imagine locals resent it. The government even wants to clear this space of all mosquitoes: the only time I see a motorized mosquito fogger is here. Is it coincidence that the pests were targeted here, though likely toxic, and optically displeasing, so the pests do not hamper the impending capitalism of these short-stay guests? Ever distrusting of the “safe” chemical spray — which leaves such an imprint as to eradicate mosquitoes within minutes, lasting where it rests for hours, days, weeks — I race ahead of it to outpace its path. I jog upwind. The thick white smoke billows from the grumbling machine. Tourists stand by to photograph it playfully. When I look back, the machine has stopped its grumble — and locals are running towards it. The machine has caught fire, and a hot red flicker pierces the white smoke around it. My lagging impression of the city is countered by a kind and welcoming family: four generations of women in one proud and elegant home. The youngest is but three months. Healthful round face, cheeks capable of a commendable smile. The babe’s mother, Isabella, is my host. She turns 31 in March, and is educated, like her mother, in information technology. My host’s grandmother is recently widowed since late last year. The mother, then, as acting matriarch, has just retired to tend to her own mother. She also prepare meals for Airbnb guests like me with delicious efficiency. When I return to the casa for dinner, Isabella is there. We talk about this and that, but I’m really curious — intrusively, perhaps — to know how a “new economy” resource like Airbnb works for hosts in this still-Communist nation. “To the government?” I ask. In my head, I begin to do the math. Isabella and her four-generation family, living under this one roof, I figure, are earning $5 USD for one night of my stay. Addiel has a cherubic face; the hairs of his face are scant for thickness. His short coif is gelled and tight; small sideburns curl into themselves to a short, sharp point. Oversized silver aviator sunglasses frame his face. We meet at Playa Rancho Luna, a white sand beach that would command exorbitant prices from tourists anywhere else. Here, sturdy palm-capped umbrellas carry no cost. Admission is free. Lunches are just a few dollars. Addiel is from Cienfuegos, where he has lived his whole life. 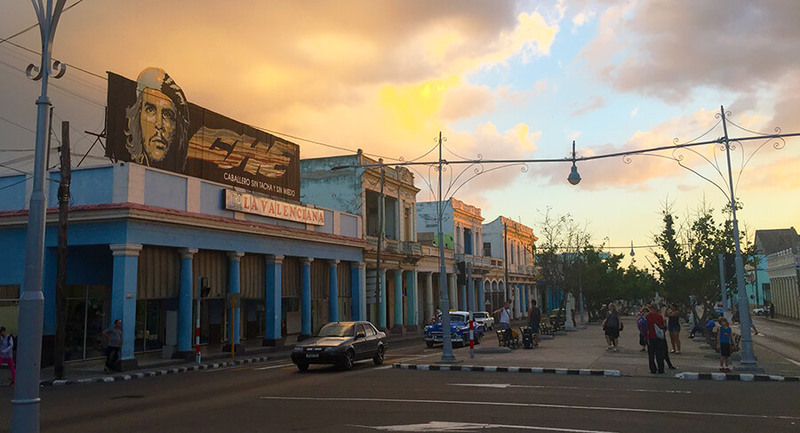 The sizeable but sleepy port city in the central southern coast of Cuba is unlike Havana: its sidewalks are intact; its main streets are abandoned; its neighborhoods are proud and bustling. But Addiel is enthusiastic and genuine, like most Cubans I meet. He wants to know of my home and – again, like most Cubans – just how cold it is at this time of year. Addiel is quick to share what he loves of my native country and its culture. Addiel loves baseball — both the Cubs of Chicago, and the Yankees of New York, namely for their star Cuban and Latin American players. Addiel also adores the pace and acrobatic talent of American basketball. He demonstrates the grace of a finger-roll lay-up; the dizzying flurry of a ’round-the-back pass. Addiel is a big reader; he envies the written word. He tells me that, later tonight, he will end his evening as he ends most: in his bed, flipping through the pages of a book. “Y Donale- Trum-?” he asks of the new American president. It’s a question I fear when traveling — anything political. Every time I go abroad, I tell myself beforehand that, this time, on this trip, this is the one where I’ll say I’m Canadian — especially if I get into a bind. But I never do. I never say anything but that I’m American. And I’ve never had a single issue about it. When Addiel asks me about the new president, he accompanies the question with a familiar hand gesture: his thumb raised from a clenched fist; he rotates the thumb from twelve-noon to six, twelve-noon to six, twelve-noon to six. “Ayy,” I groan in general dissatisfaction, intending an uncommitted answer, with a hand gesture of my own: tilting my hand side to side. I know how I feel. I’m more interested in his opinion than my own. His thumb flips south, where it hangs heavy, and he scowls his face. “Es crazy, right? !” his thumb curls into his hand and his index finger reaches out, twirling in a tight circle beside his right ear. Loco. Addiel is not the first Cuban to ask me what I think of my new president; he isn’t the first to call him crazy. Specifically, the word is crazy. The tall and blue-eyed cowboy, El Presidente, said it in Viñales; so did the Afro-Cuban sandwich shop owner, David, in Old Havana (who, granted, I came to note held a general disdain for all politicos, even famed Cuban ones). And now is the third such comment, this time from Addiel, a young taxi driver who shuttles his old fashioned, black and white, 1970s-era, Soviet-made taxi around the half-abandoned port city of Cienfuegos, Cuba. But in the island country of Cuba, carrying a history of 500 years of colonial oppression; 4 violent revolutions and 7 wars in the last 120 years; who saw the 50-year-reign of ego-maniacal commandanté Fidel Castro pass away but weeks ago; it is what I heard. The new American president is crazy.